Hi friends! 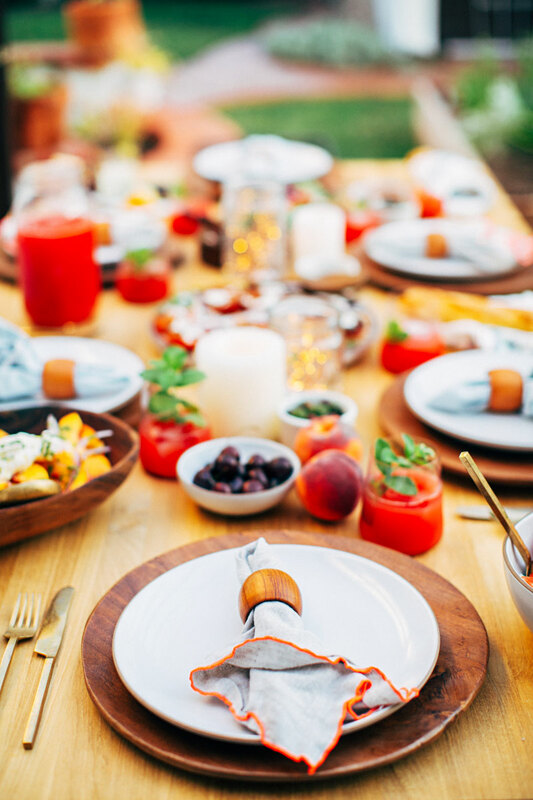 I’m excited to share today’s post with you- I’ve got the makings of a beautiful Mediterranean dinner party here to inspire your own backyard summer entertaining as these long hot days beg to be celebrated with friends and family! I created a menu that keeps your oven off and kitchen labor to a minimum, but will still provide a delicious, memorable evening for your loved ones. The trick- seasonal produce that’s fresh and beautiful, it’ll save you the trouble of hours of prep time! This post was produced in partnership with American Express. Thank you for supporting our sponsors! 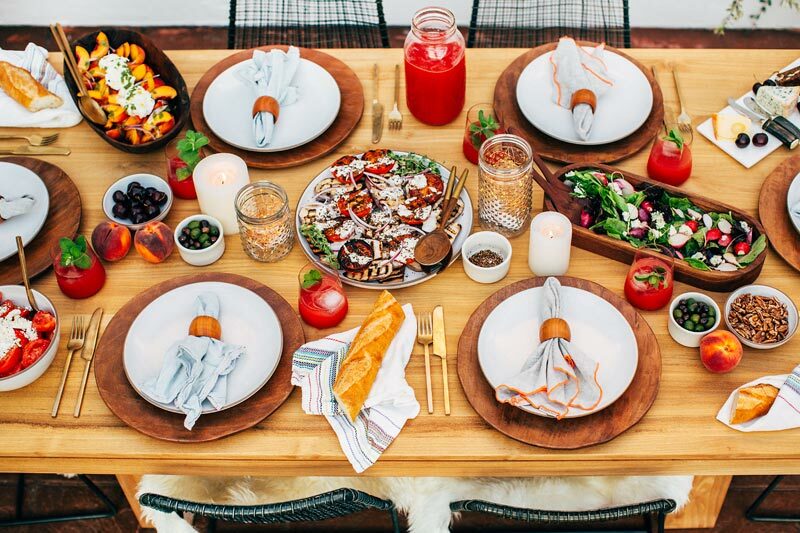 For the tabletop items I wanted to keep it neutral and let the colorful food pop, so I used our Heath Ceramics plates/serving platters/bowls, these wooden charger plates, these gold bottomed glasses, and bronze flatware & linens from Hostess Haven. The napkin rings are an Etsy find (similar). 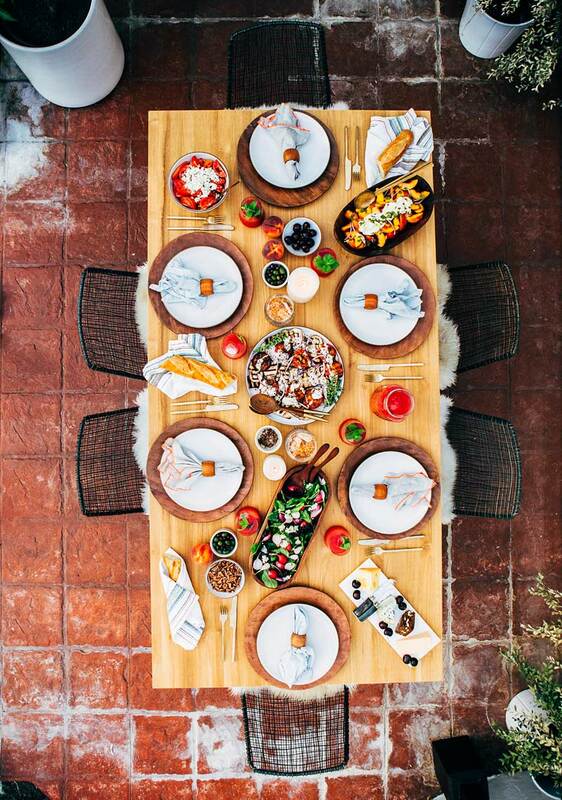 Before the food arrived the table felt fresh and easy, as perfectly unfussy as you want a backyard summer dinner party to be! And after the food arrived it was a color explosion- a feast for the eyes! 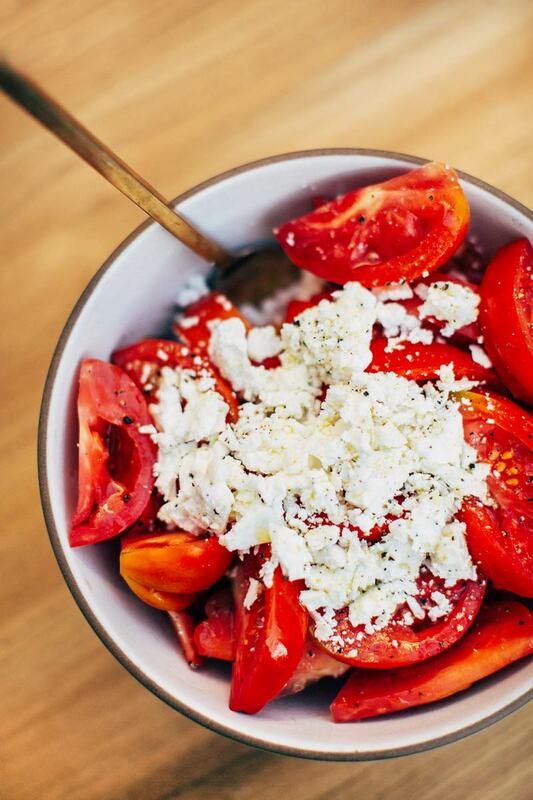 In keeping with my goals of utilizing just the season’s finest, this salad is made from the ripest, juiciest heirloom tomatoes I could find, fresh crumbled feta cheese, a healthy drizzle of high quality extra virgin olive oil (I love this brand), and fresh cracked pepper. It’s the kind of simple food that makes you wonder why you ever fuss over anything else! 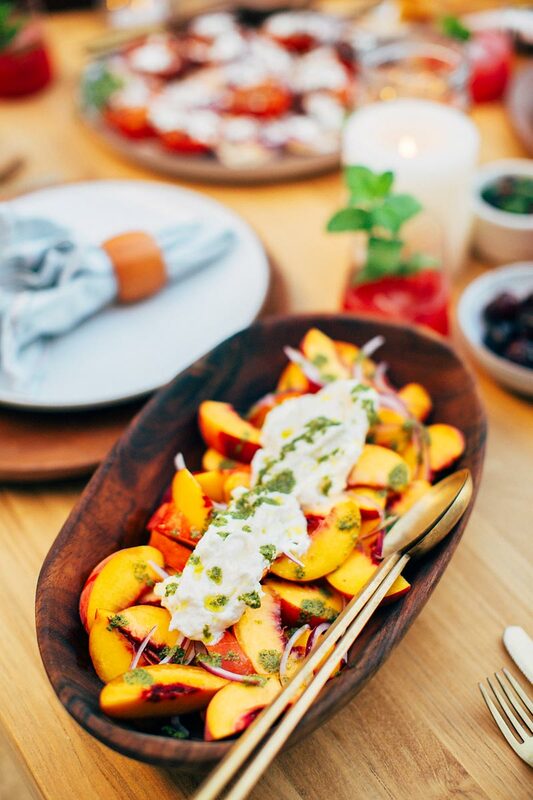 Also in the spirit of chop and go- this peach, red onion, pesto and burrata salad takes minutes to whip up and will not disappoint a single soul. To save time I bought pre-made pesto, but here’s a recipe for my homemade version if you’re interested! Again, the secret to this bowl of heaven is finding the juiciest, ripest peaches you can and the creamiest, loveliest burrata. Quality ingredients are critical when a dish is a simple as this one! 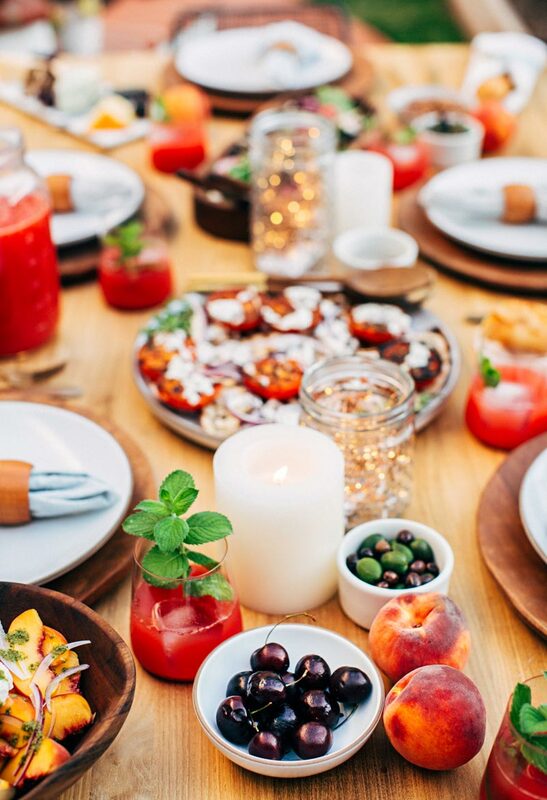 Edible table decor is my favorite- and with peaches being so especially lovely at the moment I had to include a few scattered throughout the table. And then I adore having mini bowls of tasty things spread around- they fill up space and who doesn’t love grabbing for a cherry or a few olives as they nosh?! 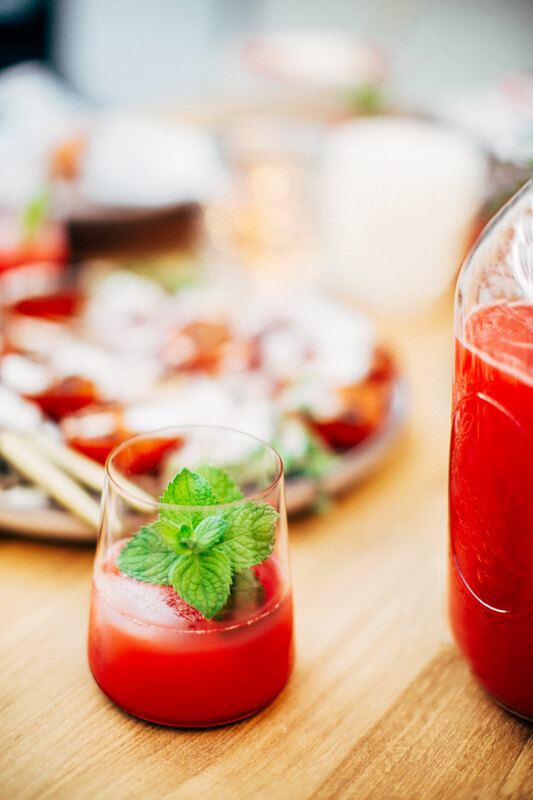 My favorite drink this summer has been watermelon agua fresca (made by blending ripe juicy watermelon and then straining through a cheesecloth). Of course adding a little bit of vodka and some torn mint leaves might make it more appealing to your libation loving pals, but the juice just as it is works for this pregnant lady! I offered our guests the choice of either, to be fair. 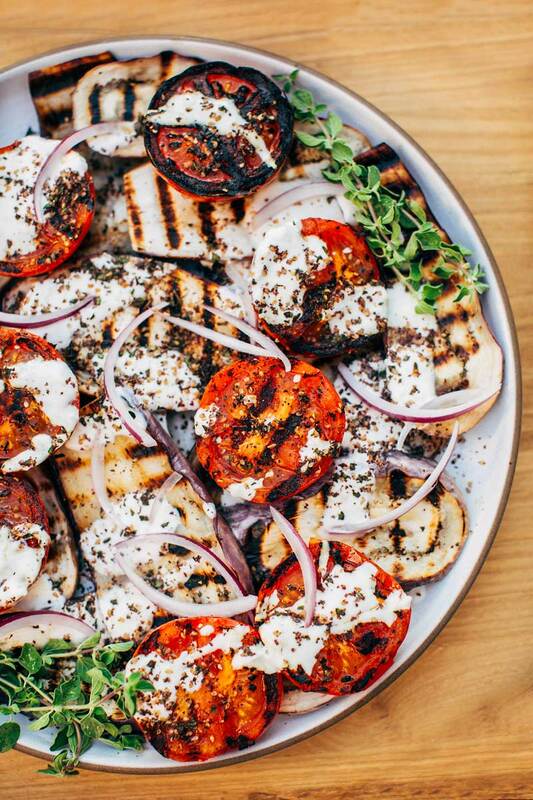 This grilled eggplant and tomato dish was the most involved to prepare, but still in the scope of things a total breeze! To make: slice eggplant into 1/4″ pieces, halve tomatoes, and brush all pieces with coconut oil. Heat grill to medium/high and grill eggplant slices and tomatoes until black lines appear (the secret to those lovely lines is to avoid moving the food on the grill as much as possible). To make the labneh: strain 2 cups of plain yogurt through a cheesecloth for 6-8 hours, add a clove of crushed garlic, a little salt and a squeeze of lemon juice. Combine well. 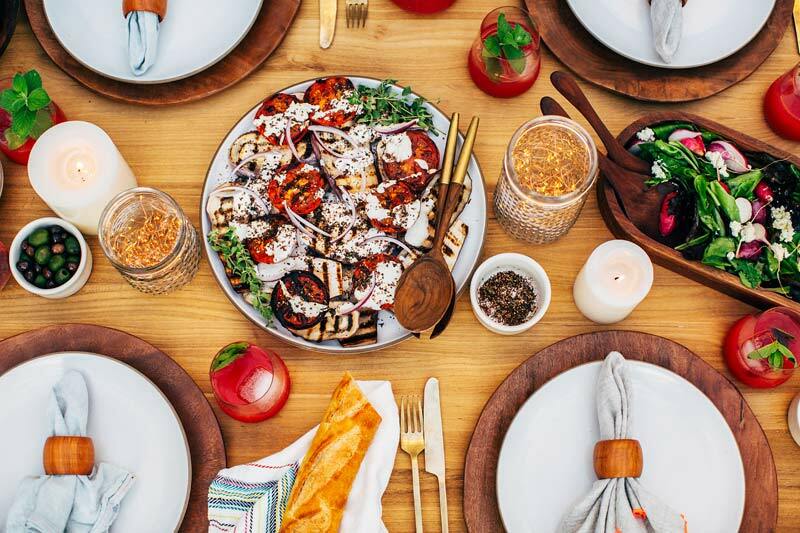 To make the Za’atar, combine 2 tablespoons of finely chopped fresh oregano, 2 tablespoons of Gomashio (or 2 tablespoons of toasted sesame seeds and 1 teaspoon of hearty sea salt), and 2 teaspoons of sumac. 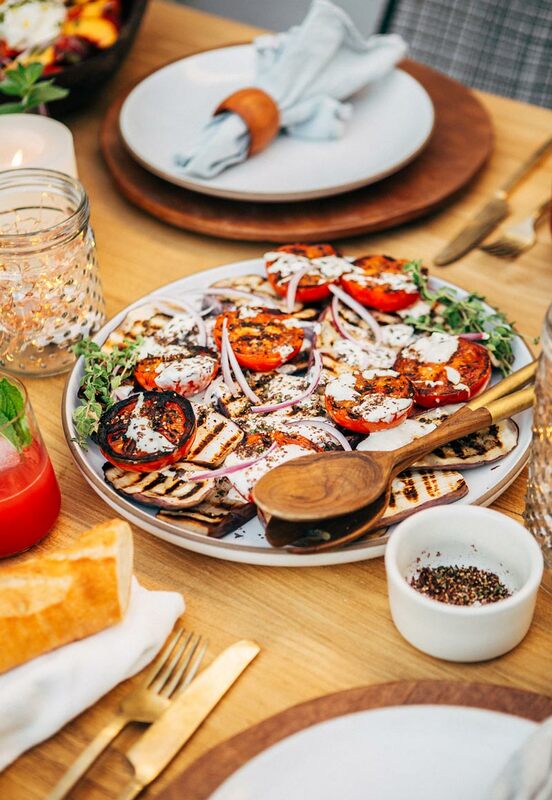 To serve, spread grilled eggplant and tomatoes on a platter, top with thinly sliced red onion. Drizzle generously with labneh and sprinkle with za’atar! This simple green salad is a light and refreshing addition to the table. 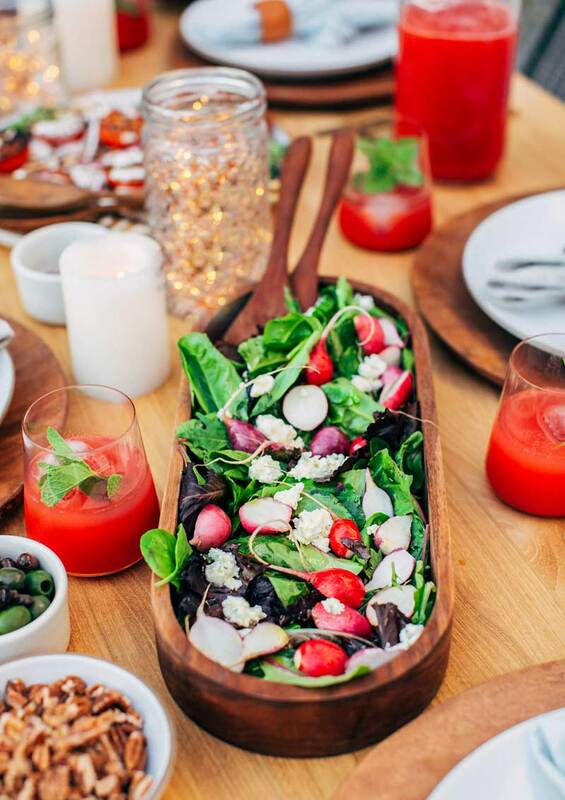 To make: combine mixed greens with halved easter egg radishes, herb whipped goat cheese (recipe here), a generous drizzle of extra virgin olive oil, a few splashes of balsamic vinegar and fresh cracked salt/pepper. Lighting is so important when dining, and generally I prefer cafe lights and candles. BUT, I saw this adorable video and thought that the LED lights in jars is a special kind of magic too! So I borrowed the idea for our party and bought two boxes of these to put into jars for an added bit of festive lighting. Ok I think that covers all that I did to create this magical evening for our friends- I hope it inspires lots of summer fun for you and yours! *As you know, you must be 21+ to consume alcohol. Please drink responsibly. where are your table and chairs from? LOVE them. Thanks Danielle, We snagged the table here and the chairs here! Gorgeous!! The food looks so good, and I love the cafe lights and that menu board! I love your blog and your pictures are always beautiful! I was unable to click on the links for your favorite olive oil and the lights; I was just wondering if anyone else has had an issue with it. I love checking out the links whenever you post them! 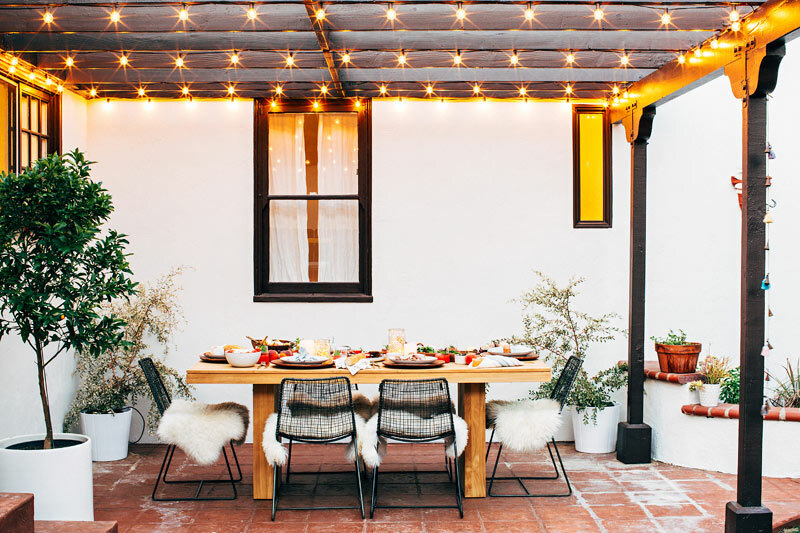 Where did you get the lights that are hanging above the table? Do you happen to have a link for those, as well? Do you mind me asking where the dishware is from? Love the serving dishes and the little dishes used for the olives and crushed pepper. And also the stemware? Love it all! Amazing – the wooden serving bowls are also from heath? And also the wine glasses? This dinner looks absolutely fantastic, and I especially love the last overhead photograph. 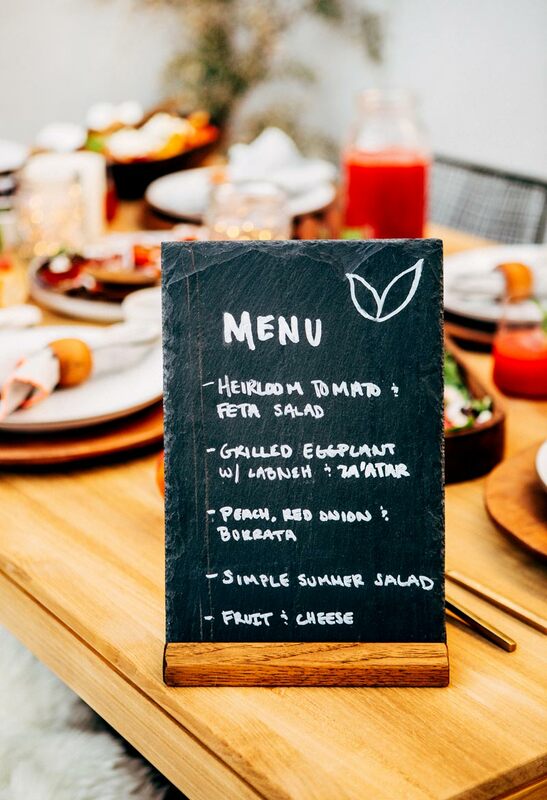 Also, I love your menu – I did something similar as a DIY for a recent dinner party (http://www.rachelphipps.com/2016/08/road-to-rio-south-of-border-inspired.html) – did you buy yours? Thanks Rachel!! Your fiesta looks like a great time! 🙂 The chalkboard was a gift, I can’t take credit for making it!